These are notes from an herb walk with David Bruce Leonard, of www.MedicineAtYourFeet.com, in Iao Valley in February 2009. We were originally planning to do a hike at "Tabletops," but the day was overcast and the conditions did not feel safe. This time, the group was composed of 8-10 people and we did the prayer circle before starting. We walked along the road and hiked up a dry stream bed. The most interesting non-herbal thing we saw was a picture in a frame mounted high on a tree trunk. The picture was an old photograph, maybe from World War II. These are just a few of the very MANY plants that we saw along the way, complete with mispellings and question marks. But, if I get corrected spellings, I will update them later. Young leaf tips are edible. The young green pods are edible, can be boiled to make it taste ok. Don’t eat too much, causes cows to lose fur. Haole koa - this picture shows mature seed pods, which are not edible. Still yet, the young seed pods may not taste that good, so I'm not encouraging anyone to eat them. But the young pods are considered edible. Don't confuse this tree with kiawe! Yellow flowers, sometimes w/ whitish sections. to the lower left of the picture. David pulled up the roots. It’s liver protective and anti-inflammatory. Oxalis is from the Greek, for “sour.” It has a sour taste. Oxalis with pretty lavendar flowers. The oxalis leaves are like clover, but much larger. See the clover growing under the oxalis. We saw a small oxalis, with small leaves and runners. It looked very similar to clover. The other oxalis, oxalis martiana, had large leaves and purplish pink flowers. The larger oxalis does not have runners. Oxalis is a blood cleanser and a sedative. Called Ihipehu in Hawaiian. A daisy-like plant, antibiotic properties. I think this is Youngia Japonica. The younger leaves do not have sori (singular: sorus), the spore like spots on the leaf. The leaves without sori can be gathered, thrown in a pot, and made into a tonic for internal use. The leaves with sori are used topically for broken bones/sprains. Hawaiians mashed them with sea salt and urine. David uses vodka, it’s more acceptable. We saw some of these growing all the roadside. Good for cancer, etc. Gotu kola - yes, they sell the tea at Mana Health Foods. Roots have a sassafras/root beer smell. Small plant that David pulled up. The smell is associated w/ plants that may be connected w/ liver toxicity, or causing liver toxicity. An acupuncturist named Lily Sue on Oahu uses these plants for patients who need liver healing. A related plant is “uwanja” (sp?) meaning “source of wisdom” can be used to give a person a long-term vision of life, a greater perspective on their life. 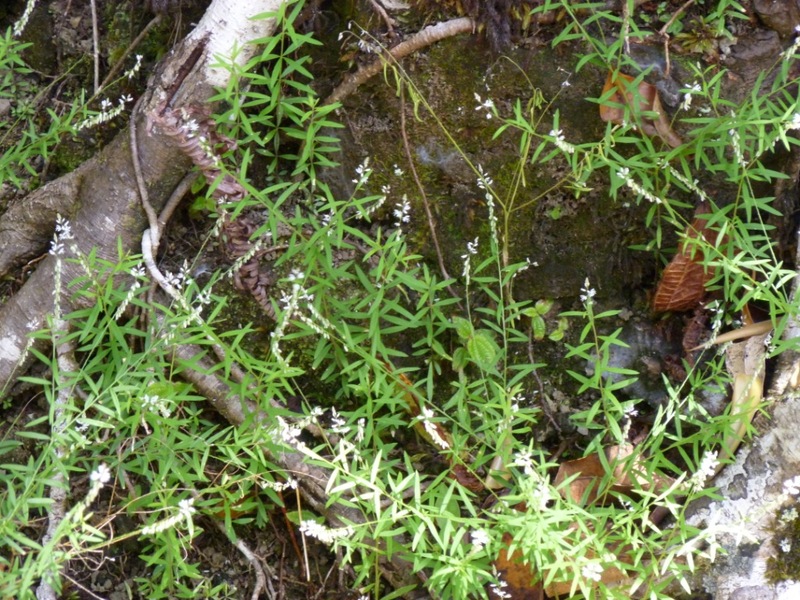 Polygala paniculata. Root beer scent in the roots. There are many more plants that we talked about... but it takes time to upload the pictures - oh, and also to find where the pictures are locate in my files - which are about 90% organized : ) If I can stop taking pictures, I will have time to organize them! David is doing a free medicine plant talk tonight at the Haliimaile Community Center from 7 pm. There was some confusion as to the location, since the Facebook page mentions Makomako Street in Haliimaile, as being "mauka" or mountainside of Haliimaile Road, but I just looked on Google Maps and it was makai or oceanside. I go through Haliimaile all the time to go to the Haliimaile Community Garden and the Upcountry Fine Art supply store, so I feel I should know where the community center is! Update: The organizers did put up signs and Makomako Street was makai of Haliimaile Road. It was easy to find, and there was a great turn-out. I'll be posting some notes from David's talk and video clips as soon as I get a chance.